Here is a list of gamebook related links for the active community of gamebook lovers out there. It is by no means complete, but, instead it is a good starting point where you can find the most active gamebook communities. For a complete list of gamebook links, visit the Gamebook Feed. www.gamebooks.orgs – Run by Demien Katz, the most comprehensive list of gamebooks out there. 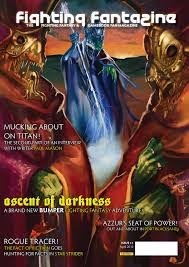 http://www.fightingfantazine.co.uk/ – The home of the best gamebook fanzine around. The Fighting Fantazine forums – Where you can find a great community of gamebook fans. Titannica – The Fighting Fantasy wiki. http://www.arborell.com/ – A website that hosts the Arborell gamebooks and also the Windhammer gamebook competition. www.ffproject.org – A website that hosts many excellent fan made gamebooks and where the owner converts some of them into hyperlinked games.